What does Veterans’ Day mean to you? Is that a question that you asked yourself this morning? It is a question that I ask myself and sadly a question that I have had to defend on more than one occasion. This is a day where everyone should stop and thank those men and women who have fought on behalf of this country and our constitution, but it is also a day to remember those veterans who are no longer alive for us to thank. From the time I was old enough to walk, the national cemeteries have intrigued me and the military has had an influence on my life. 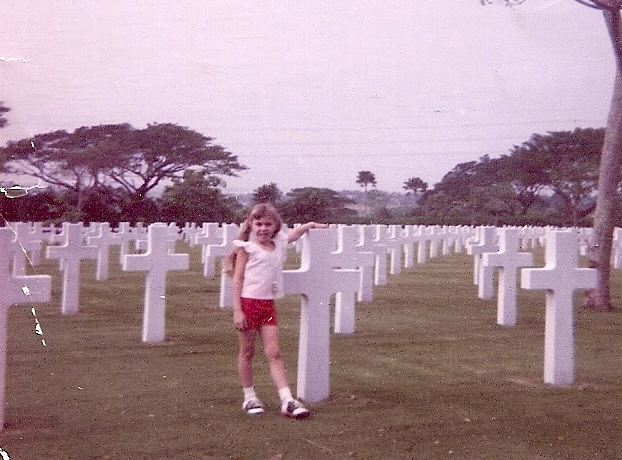 The first memory I have of the real impact of war was a trip to the Philippine Islands when I was five years old. 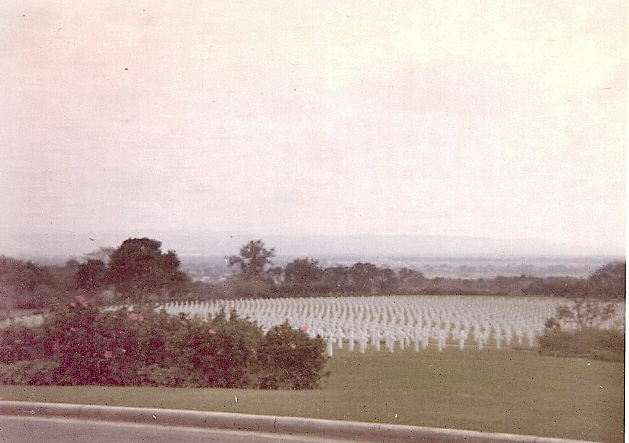 I can still remember the awe I had when my mom and aunt took me and my cousin to the American Cemetery in Manila. I had never seen so many crosses and all perfectly aligned – they went on for what seemed like miles. Over 17,000 service men and women are buried there with thousands more names listed on the memorial walls. That day I witnessed a sight that I have never forgotten. There are so many military personnel who have touched my life in one way or another – several are no longer living, but many are still in the prime of their lives, others I have forgotten their names, but never their faces nor the impact they had on me. My brother served in the Air Force for over 12 years ending up in Omaha, NE at the Strategic Air Command and spent a year in South Korea. Many of my uncles fought in WW II or the Korean War as did many of my cousins, young and old. But it was my college years where the military most impacted me. Most of my college classes were Political Science and since it was the late 80s there were many enlisted soldiers in my classes (soldiers going back to school to get their bachelor’s degrees and on to OCS -Officer Candidate School). Most were Marines and with a couple of Navy and one Army intelligence officer. Then there were the guys ones who were in the ROTC program – watching them commissioned as officers, then witnessing the start of the first Gulf War was both happy and sad. One of those ROTC gents, and a great friend of mine, just retired from the Navy after serving twenty years and thankfully with no incidents even though he spent a great deal of time overseas. Another friend joined later in life and is a JAG officer in the Air Force heading out to Afghanistan this month. At the time I was in college, the bombing of the Marine barracks in Beirut was still fairly recent and I had several discussions about the US presence in Beirut and sending troops in to Bosnia. I remember those discussions vividly because everyone was so passionate about why they served in the military. One marine told me that most Americans did not really think twice about the men and women serving overseas unless they were directly connected to a soldier, but that did not matter to him because he believed it was his duty to serve and protect our rights even if “we” did not care and he would protect those rights with his life. His statement made me sad then, and still does to this day and it is that one conversation that I also never forgot – I saw that marine commissioned as an officer in the US Marine Corps, but sadly do not remember his name yet his words I will never forget nor the look on his face the day he became a Marine officer. Then there is my father in law – who retired as a Colonel in the US Marine Corps shortly after his last deployment overseas when we invaded Afghanistan. The Colonel comes from a long line of military men – his father was a Captain in the US Marines Corps who received a Silver Star at the Battle of Guadalcanal, fought on the China mainland during WWII, then earned a Purple Heart in the Korean War and received a battlefield appointment to officer – he survived all those battles and is now buried at Arlington National Cemetery. Then there are all the men and women who have served the US since 9/11 – so many to thank. A close friend of the family was serving in Afghanistan in 2008 and was killed in action during the Battle of Wanat– he received a posthumous Purple Heart and Silver Star – there are so many like him in this decade and all the decades that came before. In 1998, I spent 6 weeks in Europe during my masters program. Although I did not plan the trip to coincide with the anniversaries of many of the WWII battles it some how did. I spent two weeks in Germany just outside of Berlin and was educated on what life was like before and after the wall came down, and then 4 weeks spent in England with side trips to Paris and Scotland. In all those places, I saw first hand the remnants of these past wars – bullet holes still in cement walls, memorials up everywhere, and even leftover divisions like Checkpoint Charlie in Berlin. Here in the states those daily reminders are not visible, but in Europe they are everywhere. Our reminders here in this country are our veterans going about their daily lives some with only emotional injuries, but so many with physical injuries. If you see a veteran, don’t look away, but instead walk up to them and thank them for serving this great country we live in. And for all of those who find so much wrong with our country these days, take a good look at life overseas for so many nations, then thank god that you were “born free” in a country that is built on that very foundation. Also pay respect to the men and women who came to this great land and endured terrible conditions to start a new nation – no we may not agree with their way of life back then or their thoughts on many subjects, BUT the fundamental basis was still FREEDOM and our military protects that fundamental right every day so that none of us will ever know true tyranny. When I was in my hometown of McKenzie, TN this summer as usual I visited the city cemetery to pay my respects to my dad, step-dad and grandmother. I have been in this cemetery so many times through out my life especially since my mother grew up behind this cemetery. 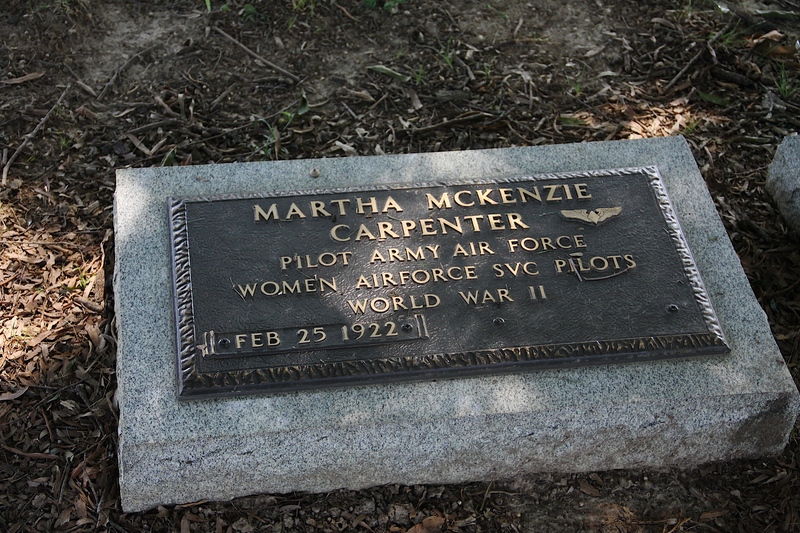 I wanted to photograph the graves of the two brothers who founded the town of McKenzie, but in the process of looking at all the graves around them I discovered the military grave marker of Martha McKenzie Carpenter and it showed her to still be living (now deceased). The biggest shock was that she was a pilot during WWII. She flew a “target” pulling plane. This past March all the WASPs, including Martha, were awarded the Congressional Medal of Honor in Washington D.C. She is 88 and was on hand along with her daughter to receive her medal. WOW! !